A report entitled “The Health Benefits of Citrus Fruits,” released in 2003 by The Commonwealth Scientific and Industrial Research Organization, reviewed 48 studies that showed a diet high in citrus fruit provides a statistically significant protective effect against some types of cancer, plus another 21 studies showing a non-significant trend towards protection. A great deal of consumer literature attributes this to the large amount of vitamin C in citrus juices, however research shows that in some cases no protection is obtained from taking vitamin C itself, while there are considerable benefits from drinking fresh, organic orange juice. In oranges, vitamin C is only one part of a complex matrix involving many phytochemicals such as flavanones, cyanidin-3-glucoside and carotenoids. There are over 170 different phytonutrients and more than 60 flavonoids in an orange, many have demonstrated anti-inflammatory, anti-tumour and blood clot inhibiting properties. But perhaps the most interesting and useful vegetable of them all is the humble carrot. Carrots have been cultivated for thousands of years, although the original carrot was almost certainly a purplish color, and not the yellow orange variety most of us know today. Carrots are filled with Vitamin A, vitamin C and vitamin K; they also contain a substance called falcarinol which, according to some studies provides protection against forms of colon cancer. With a degree of built in sweetness, carrot juice is also pleasant to drink and combines well with other healthy juices from a carrot juicer, such as apple and tomato. I was chatting with a friend last week when she confessed she had a problem. Despite her best efforts her daughter just wouldn’t take her vitamin supplements. Like most parents, my friend was anxious to make sure her daughter had the most nutritious diet possible, but her first attempt was to try supplements. I suggested a different approach. No pills, just vegetables, in the raw, most basic form. Of course like many children my friends daughter isn’t keen on eating vegetables, that’s why her mother had bought the supplements in the first place. The way around the problem is to get the goodness without the ‘veginess’ by turning the vegetables into juice, and the ideal way to do that is to use a vegetable juicer. 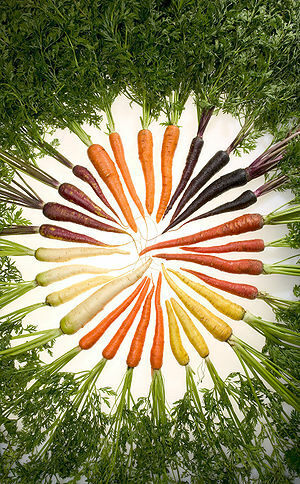 The most common vegetable to ‘juice’ is the humble carrot, a powerhouse of vitamins and minerals. It is packed with vitamin A and vitamin B as well as copper, magnesium, potassium, sodium, phosphorus chlorine, sulfur and iron. One reason it’s a good place to start is that is very good for you, but also naturally sweet. 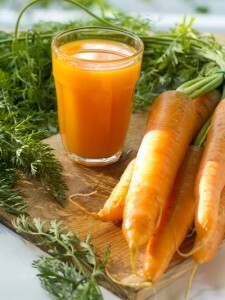 Carrot juice also combines well with other juices, so it’s a good basis for healthy drinks of all kinds. Many enthusiasts recommend adding small quantities of apple or mango juice to enhance the flavor. A vegetable juicer, unlike a blender, will grate and press vegetables from their raw state, leaving juice which contains all the goodness of the original vegetable. The end result is juice with no pulp. Carrots do well in a vegetable juicer, while bananas, the staple of fruit smoothies everywhere, are simply useless since they have no juice to speak of. It takes around 8 carrots to make an 8 oz glass of carrot juice, and this in turn provides 50,000 units of beta carotene, the precursor of Vitamin A. Carrots also contain a whole selection of the various B vitamins as well as vitamin E and a huge number of minerals, rather like a multi-vitamin pill, only in natural form! The published recommended daily dose for vitamin A is only 5000, which might at first seem to indicate that there might be a danger of overdose. The recommended daily doses set by government are those which are enough to prevent the diseases of deficiency. Most nutritionists believe that one glass of carrot juice per day is sufficient. Carrot juice is naturally sweet, but you can combine it with other juices to make some really interesting flavors. For something a little different try draining the juice from a coconut, then cracking open the shell to remove the pulp. Add it, with 8 carrots, to your vegetable juicer and when complete, add the result to the juice from the coconut. Throw in some fresh mint to garnish and you have truly interesting drink. These days we have a tendency to reach for pills and medication to solve our health problems, but in many cases our lifestyle is to blame. Human beings did not evolve to live out of the sun or to eat the complex, processed creations we find in the shops. Eating plenty of raw fruits and vegetables, and drinking their juices, is one way to redress the balance and move towards a healthier everyday life. 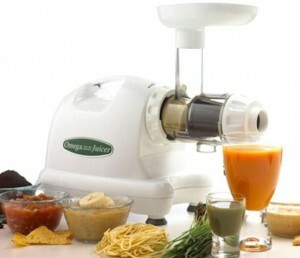 A carrot juicer makes it easy for you and your family to prepare healthy nutritious snacks and delicious drinks.